If you’re a new roofing contractor, it’s essential to invest in the right tools and equipment you’ll need to repair, replace, and install the roof. Apart from the general tool kit which includes hammers, chisels, hacksaws, screwdrivers, and wrenches, you also need to invest in other roofing tools and equipment. Ladder: Invest in a high-quality ladder that extends about 30 to 40 feet to allow ease of roof access. Safety Equipment: Ensure that your workers won’t get hurt while performing their duties by investing in gloves, hard hats, and safety glasses. Pry Bar: It helps in removing nails from old roofs that you’re replacing. Loosen nails using a flat pry bar, which can be used to demolish hard-to-remove roof areas. Cordless Drill: It is a handy tool to drill holes in metal, wood, and concrete when putting in any fastener or screw. Pneumatic Nail Gun: It is used to secure flashing and shingles, allowing your workers to hammer hundreds of nails a day within seconds, thus making the roofing process easier and faster. You need two or more pneumatic nail guns if you have multiple crews. Wheelbarrow: Easily haul debris off the work area to a dump site or trailer using a good quality or sturdy wheelbarrow. Caulking Gun: It enables easy installation of sealant or cement to the areas that need to be fixed. Framing Square: It is used to cut shingles with precision. Tin Snips: Sharp snips are used to cut flashing to the desired size and also create fittings around drip edges and gutters. As a professional roofing contractor, you need to master the necessary rooftop safety precautions to protect your employees and your customers. 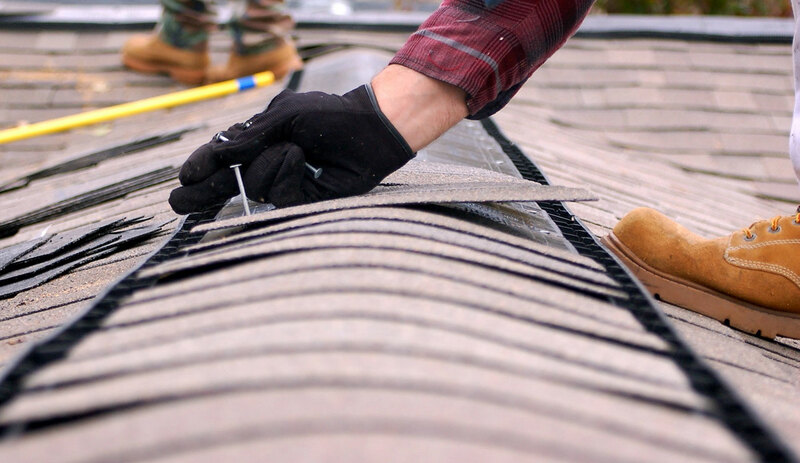 While you may have liability insurance to cover you and the property owner when damage occurs, or worker’s compensation insurance when accidents happen, applying roofing safety tips will let you avoid dealing with major problems that can jeopardize your good reputation as a business. Using the right ladder should be reinforced to access the roof. For a two-story house or building, a 28-foot extension ladder is needed to reach the rooftop safely. To safely climb up a roof, the ladder should extend 3 feet from the top plate of the property, wherein the extra height puts the rails within reach, giving you a hand-hold when transitioning between the roof and the ladder. When positioning the ladder, it should be located at the correct angle for maximum rooftop safety. Stand at the foot of the ladder then reach your arm straight. When your fingertips can reach the rungs, then you have the proper angle. Make sure to strap the ladder to the roof for added stability and to avoid knocking the ladder off due to a gust of wind. Always keep your hands on the rails when you’re stepping onto the roof by placing one hand on the rung and the other hand on the rooftop. Always maintain the three contact points when transitioning between the roof and the ladder. Don’t use the ladder’s top rung unless it was explicitly designed and stated by the manufacturer for that purpose. As a roofing contractor, you have to provide roofing options to property owners. Most of the time, homeowners rely on your expertise, most especially when choosing the right roofing repair, replacement, and new installation method. The two primary roofing methods include fragmentary reroofing and full reroofing. A partial reroof is used to remove all shingles on a roof surface and replace new ones. New shingles can be placed around the entire area from time to time, too. You can only shingle layers once; you must remove both if you already have two layers. You can’t attach your new section to other sections of the roof if you remove two shingles or the layer at the top of a layer. It could lead to a hump onto the ridge cap or too strange lines, which could damage the appeal of the curb. You may also try to match things with additional layers in the top and try to do things after the fact. If the rest of the roof is in good shape with a large section of shingles that are missing or damaged, partial reroofing is an excellent way to go. If the roof is damaged widely or if you have repair areas and the whole roof reaches its age limit, this might be the right move. It could include removing the old shingles before using new ones. The advantages of this innovative roofing solution is that the newer shingles adhere better than older varieties, and that the old shingles can be removed. Beware that, if there is only one existing layer, you could save on labor by placing a series of new shingles on the old ones. If you have two layers already, make sure that you take it to the deck of the roof. Hopefully, the tips given above have provided Barrington Contractors with useful insights for roof repair. As a roofing contractor, you need to be ready with the roofing tools and equipment your crew needs, provide safety training, and keep your roofers abreast with the latest roofing solutions for a successful roofing job.